England-based coach Leroy Rosenior has been appointed to take charge of Sierra Leone's national team for their next two international matches. The former Sierra Leone international will be at the helm of the Leone Stars for the Nations Cup qualifiers against Togo and Mali. "If I like the way things are run and the two matches go well, the move could become permanent," Rosenior told BBC Sport. Sierra Leone FA administrative secretary Abu Bakarr Kabba says Rosenior will be assisted by former Brentford coach Paul Mortimer. 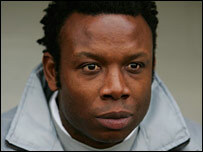 "Trainer Paul Mortimer will travel with Rosenior to Freetown on 28 May to start work," said Kabba. Rosenior's first game in charge will be at home on 3 June against Togo in the Group Nine tie. He replaces John Jebbor Sherington who will now be part of the new Leone Stars technical team. The former West Ham player Rosenior was in charge of Leone Stars when they defeated English League One side Leyton Orient 3-2 in a friendly in London earlier this month. Confusion still surrounds his future with Conference-bound Torquay United after the club issued contrasting statements over his position as manager. Rosenior had reportedly lost his job within just 10 minutes of being appointed last Thursday after chairman Mike Bateson sold the club. But managing director Debbie Hancox insists the former Brentford manager is still at the helm. Rosenior has only one cap after playing for Sierra Leone in a Nations Cup qualifier against Togo in 1993.